A soft green light illuminated her face slightly in the early morning hours as she opened her laptop. The air was damp and cool. An eerie mist coiled around the city, wrapping its grip around all the streets’ and alleys’ hidden corners. From our vantage point on the 18th floor, we couldn’t even see the surface below. The fog obscured the base of the neighboring skyscrapers as they reached up past our view, like legs of a giant concrete centipede stepping all around us. Steam rose from the fresh cup of coffee in her hands. She took a sip as she leaned closer into the glow. We were the first two people that got to work that early. She gasped as a horrified look crept over face and she turned towards me. A disconnect exists between the marketing team and the sales team. Too frequently marketers measure their performance based on the number of leads that they bring in, and the sales team is measured by the number of leads they can close. But this relies on a major assumption — that all leads are created equal. The reality is, a surplus of leads can cost a sales team commissions, especially if the marketing team is bringing in hordes of poor-quality leads. Lets work through an example: Imagine you have a small sales team of 3 people and each sales person can interact with 7 people in a day. Scenario A: You bring in 20 new leads in a day, and 10 of them are healthy leads that are likely to convert. This gives you a close-win ratio of 50%. Since your max capacity of lead-touches in a day is 21, you can expect to close all 10 of your healthy, qualified leads (100%). Scenario B: There is pressure from the board to close out the quarter on a high note, so marketing is getting the squeeze. They are encouraged to double the amount of leads that they bring in, so they make a few adjustments. After the changes are made, they are able to bring in 45 leads a day, but only 15 are healthy and likely to convert (33% close-win ratio). Your sales team can still only talk to 21 of the 45 leads per day. Unless you have a way to identify the qualified leads the total number of close-win deals falls from 10, to 7 (21 * .33 ). The sales team gets scolded while the marketing team sips champagne. Those 30 leads that are just kicking tires? Those are your dead-leads walking, your zombie leads. Many of them are too-far gone to ever bring back to life, but others are only a little sick. They could potentially be nurtured back to life with the right attention and care. Unfortunately your team’s time doesn’t scale, so you need to figure out another way to bring them back. 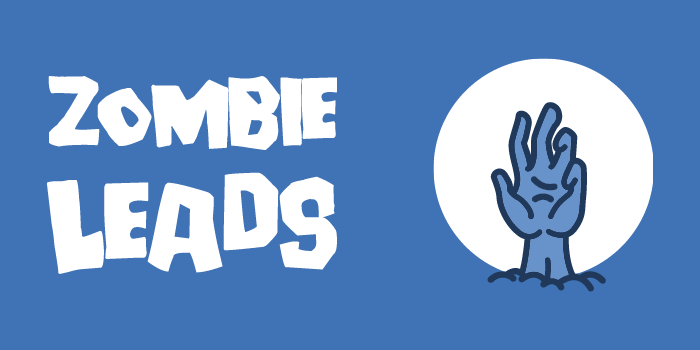 You need a way to snipe all of the zombie-leads before they enter your sales camp and overwhelm your team. You also need a safe way to quarantine the leads that are still turning. You want the sick leads to receive the care they need without exposing your sales team to the virus. Events are the actions that a contact has taken before, during, and after becoming a lead. A customer that has viewed your enterprise features page, or read a blog post about your security policy, indicates a much larger potential deal size. Marketing, sales, and support teams should sit down together to discuss what attributes and events indicate a higher likelihood for closing a deal. Use this information to create an effective lead score to easily identify which leads are healthy, which leads are sick and need nurturing, and which leads are zombies. Pro-tip: Try and ask as little as possible of your customers. Infer as much information as you can. Do *@gmail.com accounts make up a larger portion of closed-win deals? Do certain neighborhoods do better than others? Try and ignore the emotional pull, and focus on the rational. There are a couple of key things to keep in mind when you are pushing leads away. Nothing is permanent. You can always readjust to let more leads back into your camp if you grow your sales team, or if you find your team with idle time after the adjustment. Time is the commodity that doesn’t scale. If you have a surplus of leads, every minute spent with a zombie lead is a minute not spent with a healthy one. You aren’t slamming the door in anybody’s face, you are only prioritizing which leads should get a human touch, and which leads can be handled via an automation. It’s totally okay for automated leads to “pop” back up to receive a personal interaction. Lots of sales pipelines involve plenty of repetitive processes. When you task a human to handle those processes, one or more bad things can happen. A human can make a mistake, a human can introduce an off-brand variation to the messaging, and a human can get burned out. Talk to your team to determine the most monotonous tasks and automate them. By letting an automation handle the tedious, it frees up your team members to do what they do best — focus on human interaction and relationship building. This doesn’t just improve efficiency, it can improve morale as well. Day 1: Call, if there is no response send a follow-up email from a template. Day 3: Send a 2nd email from a template. Day 7: Send a 3rd email, and try and call a final time. DRY up the process by building a “blended” automation sequence. Trigger the 3-email sequence and add the final call task to the deal, as soon as the first “call” task is completed. Keeping sick and zombie leads out of your sales camp doesn’t mean kicking them out of the perimeter completely. Use an automation to keep them quarantined until they can be cured. For example, many people prefer to be self-serve until they are ready to speak with somebody. Consider the attribute-event matrix I described previously. You might have an event pattern that indicates that a lead is a very interested enterprise customer, but their attribute pattern shows that they entered only their personal information, indicating that they want to mask their status as a high-value deal. They sound shy, so you might not get very far if you reach out to them right away. It might be better to leave them alone for the time being. Start them in an onboarding sequence to educate them about the best way to tackle their current problem on their own. Once they finish the initial onboarding sequence move them into an RSS campaign so that they stay engaged. Make sure to tailor the RSS feed so that they only receive information that is relevant to their persona-type. Continue to monitor their behavior, and bring them back “up” out of the holding pattern when they fit the attribute criteria, or take some sort of event that indicates that they would like to speak with somebody. Pro tip: Take advantage of search boxes on your site to indicate that a user is in distress. Most search boxes will create a query parameter in the URL similar to q= or query=. Use site tracking to proactively reach out to somebody that isn’t getting the answer they need from the search boxes on your site. Marketing should be a foundational base layer that spans across your entire org structure, not a department that just brings in as many leads as possible without focusing on quality. Sales teams can get overwhelmed, and every bad lead costs your organization money on the front (CPL) and the back (sales opportunity cost, support costs). Use lead scoring to measure the number of “points” that are being brought into your camp, not individual leads as commodities. Gather feedback from the sales team to keep lead scoring criteria up to date. Focus human tasks where automation tasks break down (relationship building). Use marketing automation sequences to nurture leads until their lead score is worth human intervention.